Physical wellness encourages participation in regular physical activities that improve cardiovascular endurance, flexibility and muscular strength. It also involves engaging in healthy activities that benefit your body such as nutritious eating and exercise. Physical wellness means living responsibly and taking care of your body. 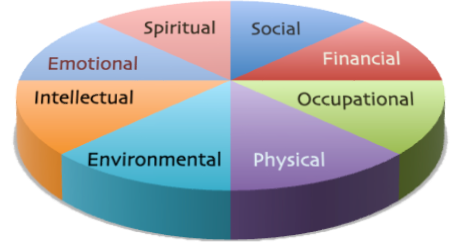 Occupational wellness is one’s attitude about work and career. This dimension involves preparing for and participating in work that provides personal satisfaction and life enrichment, and feeling comfortable and confident in the workplace and managing stress. Occupational wellness is being in a work environment where you accommodate each other’s weakness and strengths as well as your own. Environmental wellness refers to one’s relationship to their surroundings that affect humans’ wellness. It refers to living in harmony with earth by becoming aware of one’s interactions with nature and environment and the impact such interactions have. Spiritual wellness addresses values and ethics and the degree to which our actions are consistent with these values. This dimension involves seeking meaning and purpose in human existence, and being in-tune to your personal growth. Spiritual wellness enhances the connection between your mind and body. Intellectual wellness encourages continued learning, problem solving and creativity. This dimension involves improving verbal skills, showing interest in scientific discoveries, awareness of social and political issues and reading books, magazines and newspapers. It also involves engaging in creative and stimulating mental activities. Intellectual wellness is using the resources available to expand your knowledge, improve your skills and increase your potential. Financial Wellness is your relationship with money and skills in managing resources, as well as your ability to make good consumer choices and seek out appropriate financial opportunities. Social wellness involves contributing to the human and physical environment for the betterment of the community. This dimension encourages taking an active part in improving the community in which we live and the world in general, by supporting a healthy living environment and initiating better communication with others. Social wellness is developing healthy relationships with those around you. Emotional wellness addresses awareness and acceptance of our own feelings and the feelings of others. This dimension involves feeling positive and enthusiastic about life and ourselves, and being comfortable with self- expression. Emotional wellness is paying attention to self-care, relaxation, stress reduction, and the development of inner resources.